After living and working for years in Silicon Valley, Califonia, Wang Jianzong came back in 2015 to work in China's Silicon Valley - Shenzhen, a tech hub in South China's Guangdong Province. "I met a friend who still works in Silicon Valley a few days ago. He envies my life now and asked me to look for job opportunities for him in China," he told the Global Times. Working as a senior product manager at Ping An Technology and focusing on emerging technologies such as artificial intelligence (AI) and big data, Wang travels from time to time to different places and works long hours. "It's a completely different working pace from those days in San Jose," he said, adding that when he worked at a US tech firm years ago, it was much less intense. China has been on the rise as a technology superpower in recent years, with a number of its unicorn companies taking dominant positions around the world. A Hurun Report indicated in 2018 that a new unicorn company - one which is valued at $1 billion or more and not yet listed - is born every three days in China, and some reports suggested that China is quickly catching up with the US in sectors such as AI. In addition to government support and growing investment, tenacious and hardworking entrepreneurs are seen as a major driving force behind the rapid growth of the tech sector. But this growth comes at a specific human cost. 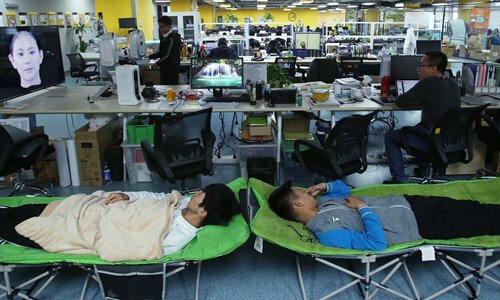 Hangzhou-based Internet firm Youzan is reportedly mulling an extension of its working hours by adopting the so-called 996 schedule: Its employees are expected to work from 9 am to 9 pm, six days a week. At its annual conference, employees were encouraged to work long hours and that not separating their work from their personal lives is in line with the company's corporate culture, a netizen who claimed to be a Youzan employee said in a post shared online. The company's senior executives cited Huawei as an example at the conference by saying that family members should be supportive when employees need to work long hours. Ren Zhengfei, founder of Huawei, once persuaded Li Yuzhuo, a senior executive, to get divorced when Li complained about not being able to take care of his family because of the crazy work pace, according to media reports. Huawei, known for its "wolf culture", encourages employees to work aggressively and follow rigorous discipline, and many believe that is what has led to its success today. Ya Ji, a former employee of Huawei, spent more than three years at the Chinese company but now works at a foreign company in Beijing. At Huawei, he used to work from 9:30 am to 10 pm and sometimes longer than that, since "there were lots of missions to complete," he said. Ya and most of his colleagues worked at least one day on weekends. "Sometimes we had to work overnight when there was an emergency, but that didn't happen often and we could have a rest for the whole morning the next day," he told the Global Times. To preserve his health and take better care of his family, Ya quit Huawei and began working at a foreign company in late 2018. He said his current workload is about one third of what it was at Huawei. Although he doesn't make as much as he did at Huawei, Ya is satisfied. "At least I can go home early every day to be with my family and get enough sleep on the weekend." Chinese internet companies are mainly private enterprises, which have experienced all kinds of ups and downs, an insider close to BAT - Baidu, Alibaba and Tencent, China's three internet giants - told the Global Times. "Ambition and dedication are always the key parts of corporate values. Whatever the size of the corporation, they are essentially a startup company that aims to maximize the value of each employee," he said. For many Chinese entrepreneurs, the vigorous competition between different teams in a corporation is more obvious that in more traditional industries, and this is a significant driving force for groups to work harder. 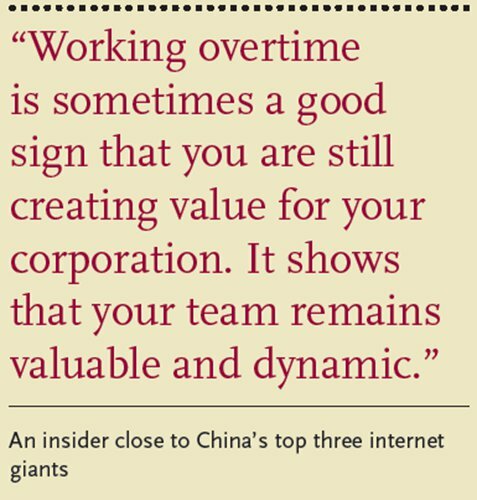 "Working overtime is sometimes a good sign that you are still creating value for your corporation. It shows that your team remains valuable and dynamic," the insider said, adding that if you're feeling laid back, then you should feel concerned, as your team might be disbanded the next quarter. A former employee of NetEase who asked to remain anonymous told the Global Times that at the company's headquarters in a suburb of Hangzhou, East China's Zhejiang Province, working, eating and living can all be done in one building. "Food is free. Dormitories are provided to those who work overtime," she said. Some of them are exhausted and have no personal life. She works in Beijing, but every time she has to go to Hangzhou, she is unable stand the work pressure there. "Maybe some people are willing to exchange their life and health for money," she said. "But I'm not." Proposing 996 schedules and encouraging employees to do overtime has sparked controversy online, with some seeing it as a superficial move that does little to boost corporate development in a sustainable way. More importantly, it is likely in violation of labor laws in China. Zhang Xiangqi, an expert on labor law, told the Global Times that the working hours required by Youzan obviously exceed the working hours set in the Labor Contract Law. Even if an oral agreement is reached between labour and management, it may still be breaking the law, he stressed. Compared with Chinese internet companies, US firms usually have more flexible working hours, which have not prevented them from achieving positive results. "Although employees in US companies clearly separate their lives from work, if there is an urgent task, many of them would respond to it voluntarily, as long as the company had a good management system, widely-approved corporate culture and competitive incentive mechanism," Chris Dong, an expert from International Data Corp who oversees both Chinese and US technology sectors, told the Global Times. In such circumstances, with or without 996, employees will work hard to meet the company's goals, and their hardworking spirit will be transformed into "an ability to win," he said. As a product manager at a job hunting company in Silicon Valley, Wendy He was grateful for her flexible working hours. "As a product manager, I have lots of meetings. If I have early morning conferences, my company allows me to stay at home and conduct conference calls," He told the Global Times. She noted that even if they don't work for long hours like internet companies in China, they work as hard as their colleagues who leave work at eight or nine at night. 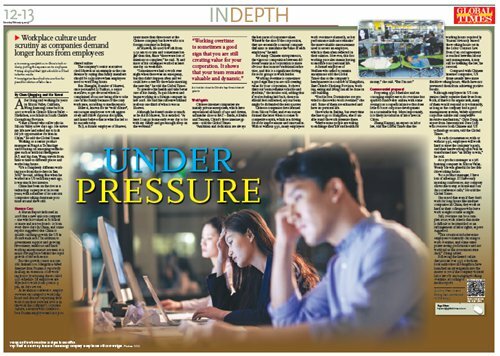 Still, overtime can be a complex issue, with criteria that make it difficult to be identified as an infringement of labor rights, experts suggested. "This situation includes some employees voluntarily choosing to work overtime, and some enterprises seeing performance and not workload as the assessment standard," Zhang added. Following the heated online discussions over 996 schedules, local authorities in Hangzhou have launched an investigation into the matter to see if the company violated labor laws by encouraging working overtime, according to media reports.